Front row from left: WV BOE member James Wilson, Marshall County Schools Superintendent Jeffrey Crook, Moundsville Mayor Allen Hendershot, Benwood Mayor Edward Kuca Jr., WV Delegate-Commissioner Elect Mike Ferro and Marshall County Schools BOE President John Miller. Back from from left: Marshall County Commissioner Scott Varner, Marshall County Schools Assistant Superintendent Corey Murphy, JM Principal Cassie Porter, WVU Medicine- Reynolds Memorial Hospital President/CEO David Hess MD, Marshall County Commissioner John Gruzinskas, Marshall County Chief Deputy Sherriff William Helms, Marshall County Sherriff Kevin Cecil, Marshall County BOE member Brenda Coffield, Marshall County BOE member Dr. Duane Miller, Marshall County Education Association member Matt Mandarino and AFT Marshall County Vice President Jessica Bramer. 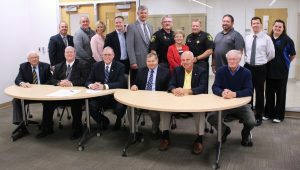 On Friday Marshall County Commissioners as well as the mayors from the cities of Marshall County, members of the West Virginia Legislature along with the Sheriff gathered to sign a proclamation declaring November 12-16, 2018 as American Education Week in Marshall County. Also attending the signing were members of the Marshall County Board of Education, administrators of Marshall County Schools, administrators from John Marshall High School and representatives of the West Virginia Education Association and the American Federation of Teachers (AFT). A luncheon prepared by the JM ProStart students followed the signing. The theme this year is Great Public Schools: A Basic Right and Our Responsibility. American Education Week spotlights the importance of providing every child in America with a quality public education from Pre-K through college, and the need for everyone to do his or her part in making public schools great. The first American Education Week was observed from December 4-10, 1921 with the National Education Association (NEA) and the American Legion as the co-sponsors. The following year the U.S. Office of Education joined the weeklong celebration as a supporter. Since then more than a dozen sponsors, including the U.S. Department of American Education and the AFT, have joined the founders for this annual event. American Education Week is now recognized every year the week prior to the week of Thanksgiving. Therefore, be it further resolved, that we proclaim November 12-16, 2018 as the 97th annual observance of American Education Week. Proclaimed this 9th day of November 2018.